Quesadas are typical of La Vega del Rio, a rural village in the Santander province of Cantabria where the milk, cheese, and butter are exceptional. 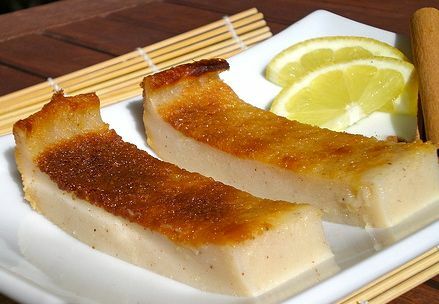 There is a saying that sums up the popularity of this dessert: si te vas a Santander y no pruebas las quesadas, tu te dejas lo mejor y viajaste para nada. (If you go to Santander and don't try quesadas, you are missing the best and have travelled in vain). Although this cake is made with fresh cow's milk cheese, it doesn't resemble the ubiquitous American cheesecake, which has a much denser, heavier texture and is usually made with a crumb crust. I have used typical Spanish pans here for baking the two cakes, but you can use similarly sized pans, such as 7-inch square pans, keeping in mind that the cakes are not very high. In a medium bowl, lightly mash the cheese with a fork until evenly crumbled. In a large bowl, combine the eggs, sugar, and butter and mix with a rubber spatula until well blended. Gradually add the flour, stirring after each addition until fully incorporated before adding more. Add the crumbled cheese, lemon zest, and cinnamon and fold them in gently just until combined. Transfer the batter to 2 pans each 6 by 8 1/2 inches and 1 inch deep. Bake for 20 minutes, or until a toothpick inserted into the centre comes out clean. Transfer to wire racks and let cool in the pans. To serve, cut the cooled cakes into squares or rectangles and serve directly from the pans.